That looks really good Andrew. 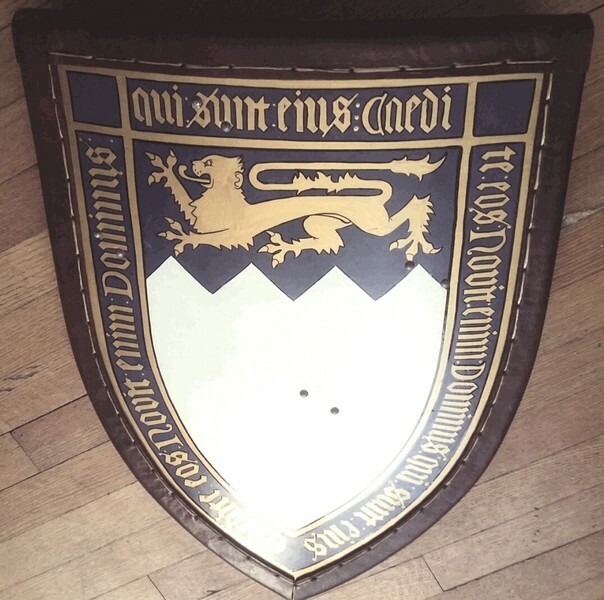 Congratulations on an awesome shield. Did you do all of the carving on the leather parts? Very nice Andrew! The painting is what catches my eye the most. The rest of the shield is fantastic but the paint.. wow! Thanks Scott, Yes I carved and tooled all of the designs. Thanks Paul, Though I did not use any paint. This was all done using leather dye. A very long and tedious process but the final results are worth it. That is truly impressive Andrew. How much does the shield weigh? How long did it take to do all of the work on this? The shield weighs in at 4.5lbs. Hard to say how many hours were put into this project. I completed the carving/tooling earlier in the year and never got back to it due to summer projects,work,etc. I estimate around 40 + hours. Heater shield WIP. I took the plans from ye old gaffers and made some modifications. 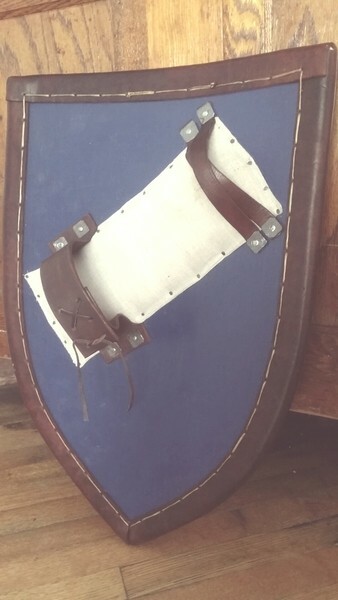 The shield itself is made of 3 layers of 1/8" poplar glued then covered in layers of linen. Gesso then acrylic over that, polyacrylic clear, then 1shot lettering enamel over that. Strapping will be an x pattern up for the hand and a thick strap with buckle for the forearm. Still debating whether to add a guige or not. 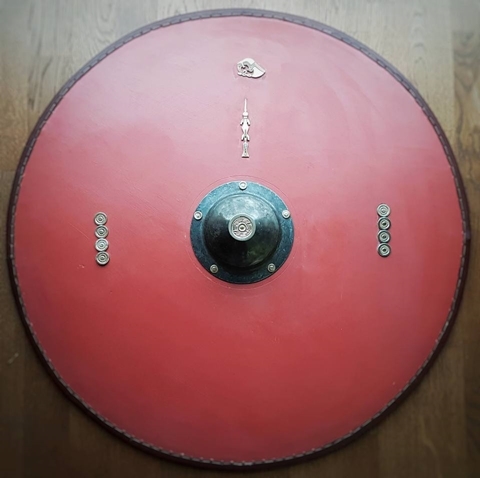 My reconstruction of the 6th century shield from Grave 21/868, Tranmer House cemetery at Sutton Hoo, based on details published in the site report and a British Museum technical report on the construction. The board is ash, as was the original, glued together with cheese glue made according to the recipe given in Theophilus. Ash is not a common wood for shields but 6 of the 7 shields from this cemetery (where species has been identified) were ash, with the other being oak, which is even more unusual. This may be an indication that the shields were made for burial, not for combat. The planks are 8mm at the boss, thinning to 5mm at the rim. 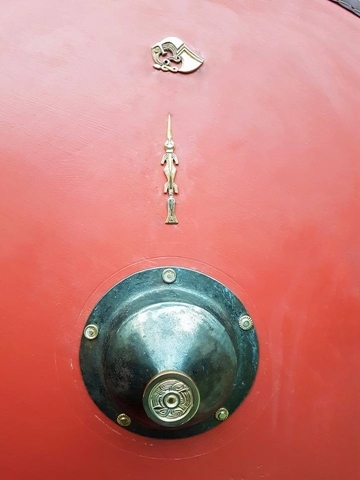 In the case of this particular shield, the grip on the back was held in place with rivets which were never peened, so the acted more like pegs. 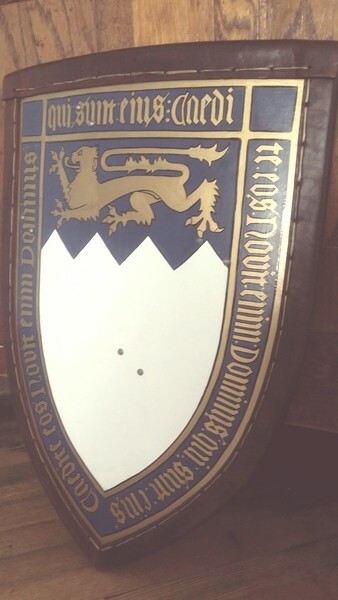 Again, not something expected in a shield which saw use. The fittings are copper alloy, gilded and with silver sheet soldered to the surface in parts as per the originals. All done by Dave Roper of Ganderwick. The coverings of leather are glued on using cow hide glue, the one on the rear being applied after the fittings were placed. The front covering was painted with a gesso made of chalk, powdered clay and hide glue as the original had traces of both calcite and aluminosilicate between the fittings and the board. I mixed some red ochre pigment from the ancient iron mine at Clerewell into this, which gives the gesso it's colour (although there is no evidence for what, if any, colour was added). The gesso layer was then sealed with a layer of beeswax varnish (beeswax and tallow) as beeswax was also found between the board and the fittings. The stitching around the rim is with some waxed, handmade hemp thread. Overall, quite pleased with the final results and it was interesting to bring different period methods together. This is amazing. Outside of this shield and the one from the main Sutton-Hoo mound, were there any other shields excavated? Here is my humble first ever attempt at a ca. 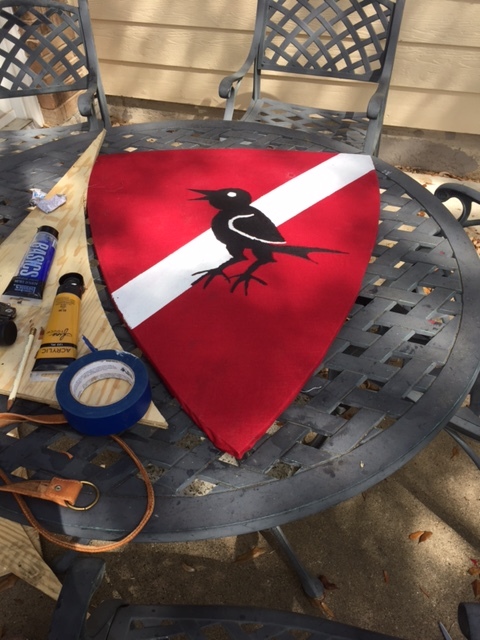 1300 infantry heater shield that I finished this afternoon. Slightly curved and covered in linen; I based the shape on illustrations in manuscripts as well as the Arnold von Breinz. It is about 34 in long and 24 in wide at the top, weighs about 6 lbs. 10 of them featured some sort of decorative mounts, this one being the most complex. One other had a lozenge shaped mount as well as disc headed mounts and 8 others just had disc headed mounts varying in number from 2 to 6. In the mound cemetery, I think that Mound 17 (the young prince and horse burial) is the only one apart from Mound 1 which still had a shield when excavated. It had a simple boss and four large disc headed mounts. Are made according to the descriptions of the conquerors, that is to say with hard wooden poles, lined with cotton cloth and feathers, the shields are very flexible. Those feather shield recreations are fantastic looking!